SGIA Expo 2017: Thank You! The 2017 SGIA Expo in New Orleans was a huge success! Our team had so much fun spending time with friends new and old, discussing challenges, opportunities, and learning about what you’re excited about too! The high-energy atmosphere was incredibly contagious and fueled all three days of this year’s show! We proudly added two Product of the Year Awards to our collection, as the Pacific Coast Fabrics team (now part of the TVF Team!) won two awards. The winning fabrics are as follows: Media – Textile – Banner: Heavy Deko-Stretch 8488GFS and Media – Textile – Canvas: Basketweave Canvas S/565. Please contact us for samples or additional information on these fabrics. Our booth was absolutely stunning and would not have been possible without our amazing partners. 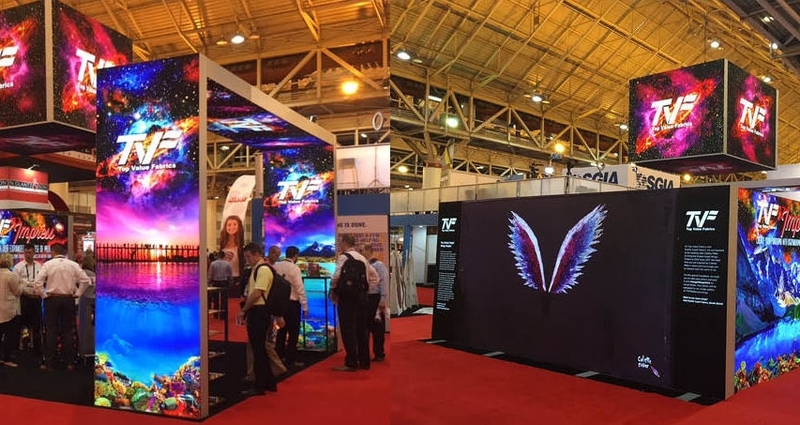 Thanks to Planet Tradeshow for printing beautiful graphics on our Supernova and Matrix Frame for creating our impressive custom backlit booth structure and hanging sign. These graphics and frames both set the standard for excellence in tradeshows! We would also like to thank world-famous artist, Colette Miller, for loaning us two pairs of wings in partnership with her Global Angel Wings Project. The wings were a hit with attendees! Read more about the project and view our online gallery here. Thank you to everyone who visited us at the SGIA Expo!